A rackmountable server, the KB Encoder/Transcoder Server features redundant power supplies, RAID configurations and supports multiple channels. The KB Encoder/Transcoder Server is ideal for enterprise-grade internet streaming and fits within existing enterprise infrastructures. Give your Internet audience the best viewing experience regardless of their geographic location, network conditions or preferred device. With the software-based KB transcoder, you can deploy on-premise or in the cloud and encode/transcode video up to 1080p to distribute as a cascade of adaptive bitrate RTMP/HLS/MPEG-DASH streams across the world’s largest CDNs, giving you the highest quality per bit. Get the most out of your Uplink connection to the Cloud when your Internet connection at the source isn’t very reliable, and bandwidth is limited, simply send your video streams to a transcoder in the cloud to take care of adaptive bitrate (ABR) distribution. 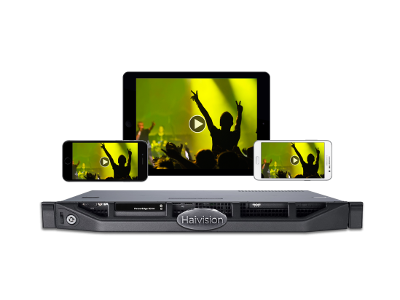 With support for HEVC and Haivision’s SRT (Secure Reliable Transport) technology, the KB Series uses up to 50% less bandwidth than H.264, and makes low-cost, readily available public Internet connections secure and reliable for live video transport from the source to the cloud, getting the most out of your available uplink bandwidth.